I don’t want to kill them. I don’t even want to kill you. But I can’t abide you trying to kill me. Sometimes an experimental super soldier serum turns you into Captain America, but sometimes it turns you into Deathstroke. With the strength of a gorilla, the ability to use 90% of his brain at once, super reflexes, and a healing factor, the merciless mercenary has taken down more than his fair share of superheroes. He’s stabbed the Flash, deflected Green Arrow’s arrows, and even slapped Batman silly in hand-to-hand combat. And all with one eye closed. 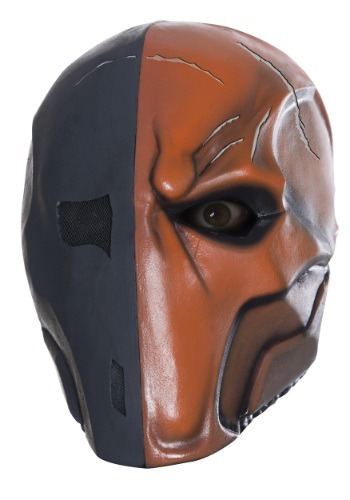 The officially licensed Deathstroke mask has a subtle eye opening on its right side, so at least you’ll have better depth perception than Slade Wilson. Just go easy on the Teen Titans. Some of them are still kids.